When you know how to plan a well-organized 5K, your nonprofit has the potential to attract a cult following of avid racers and supporters who participate in your fundraising event year after year. In fact, as a competitive runner for the last 10 years or so, I always make a hotel reservation for my favorite race for the following year on the same day that I run it. The key to building such loyalty is to execute an event that not only runs smoothly, but also wows everyone involved. This includes people beyond just your runners. It’s also essential to create positive experiences for and develop relationships with your volunteers, local businesses, government officials, and the community at large. Use these 24 tips on how to plan a 5K to ensure that your nonprofit puts on a memorable event that crushes goals and that people look forward to participating in. Pro Tip: Fifty-seven percent of campaign traffic on Classy comes from social media. Make sure your online fundraising software makes it easy for participants to share their registration so that they can easily tap their networks for donations. Consider offering discount codes or a tiered pricing structure that increases as you approach the event date. This can benefit both your organization and the consumer. Runners who are loyal to your event or are early adopters are rewarded with cheaper prices for their early registration, and your organization has the opportunity to raise prices for the same offerings as the event nears. 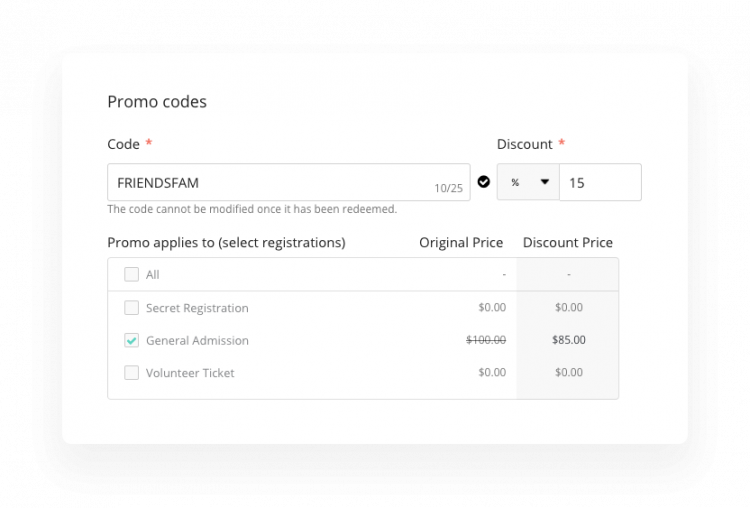 An added bonus of using discount codes on Classy is that you can assign unique codes to specific event marketing tactics. For example, if you provide a friend and family discount to volunteers, current donors, and attendees from previous years, you can track the effectiveness of that effort once you perform your campaign retrospective. Screenshot of Classy Manager discount code options. This might seem like an obvious rule, but I’ve had to pay for post-race water before. When you have runners of all experience levels streaming through the finish line—99 percent of whom likely don’t have their wallets on them—and you fail to offer free water right away, you’re going to have some angry, and thirsty, runners. Where possible, have water stations at wider sections of the road to accommodate tables on both sides of the street and ample space for runners who do not wish to stop to pass through the middle. If the road is not wide enough to allow a clear path through, only set up tables on one side of the road. Your race’s design will directly impact a participant’s overall experience. When possible, avoid down-and-back routes and hairpin turns. These routes and turns often force runners to change directions by 180 degrees suddenly, which causes congestion and the runner to lose momentum. This is especially important to consider in short races like 5Ks where your fast athletes will lap slower competitors and cause congestion in the race path. Be sure to share the course map and key pieces of information, such as elevation changes, on your website in order to prepare runners. Also notify runners ahead of time of any course obstacles that may impact race time. For example, let them know if a public transportation system will be crossing the race’s path, or if cars must occasionally be let through. If a competitive runner is unaware and forced to stop and dock time off of their race, it could be very frustrating. When possible, avoid routes with these obstacles as competitive runners may decide not to participate because of it. At no point in time during the race should a runner have to question their direction. A wrong turn could be highly upsetting to event participants and negatively impact their race time and overall experience. In order to create a positive race flow, clearly mark any turns that may cause confusion and consider posting a volunteer to direct runners. One of the beautiful things about running is that it encourages a wide range of athleticism. Running events have the potential to attract people of all fitness levels to participate, whether they’re couch-to-5Kers, walkers, PR chasers, or record breakers. If you’d like to encourage all levels of participation, consider advertising your 5K as a run/walk event. You can also arrange a longer distance run after the 5K in order to attract competitive long-distance runners as well. How much time roads can be closed for will depend on your arrangements with city officials. This will impact how long the course can remain open, and the level of competitiveness of your race. The less time you have the roads closed off, the more competitive your participants will need to be. If you decide to arrange a race that targets several audiences of runners, your race should empower the couch-to-5K runner to feel just as personally successful as the record breaker. For this to be possible, make sure you allow them the necessary time to finish. If you plan to distribute any key items after the race, such as pins or medals, place volunteers at the finish line to distribute these items. This ensures every participant receives the item without having to wait in a long line after the event. Offering race memorabilia is a great way to remain top of mind with a runner after the event. Your reception area should also include water stations, a bag drop (for longer races), and a family meetup area (for larger races). Volunteers and heavy signage are critical for a successful and streamlined receiving process. Use large signs that display bib number ranges for the bag drop area, and letters of the alphabet for family meetup areas. Swag is now a must-have part of the race experience. Whether you offer branded pint glasses, T-shirts, race jackets, draw-string bags, or medals, you’ll want to think through what your demographic of participants would appreciate the most. Activewear or performance T-shirts have increased in popularity at races and now seem to be the standard for branded race garb. Keep this in mind when you design your shirts. Usually denoted by color or letter, running corrals help to make a positive race-start experience by grouping runners of similar pace together at the start. This prevents race congestion and grants runners a less obstructive course. Many races ask for verification of pace times in order to enter certain corrals. Depending on how large your event is, you may want to restrict access to each corral by setting up physical perimeters monitored by volunteers. When you restrict access, you ensure only runners qualified to run at that pace are in that designated starting group. This will prevent misrepresentation and contribute to a positive, uncongested course flow. While some runners may use GPS on their phones or watches to track their mileage, clear signage and mile marker clocks displaying the start/finish line time are great morale boosters for runners. For example, as runners cross mile two, they might see that it’s been 20 minutes and 30 seconds since the start gun fired. Depending on when they themselves crossed the start line, (and thus activated their own time chip), they can mentally adjust their personal time to this overall race time. If a runner noticed that they personally crossed the start line at 1:07, they would know that it’s taken them roughly 18:53 to get to the second mile marker. This helps orient them and informs them to be as successful as possible. My favorite running events went out of their way to make participants feel special and part of a larger community. For example, I was recently offered the opportunity to select the text on my race bib, and I loved the personal touch. Many runners like to save their bib numbers as memorabilia and display them in some fashion, so offering this level of personalization can increase affinity for your bib numbers and make participants all the more likely to save and display them. This, in turn, reminds them of their experience and keeps your organization top of mind. Events can be banned from communities if the cleanup is not well-executed. They recommend enlisting a fresh group of volunteers strictly for this element as it often needs to be conducted in a timely fashion to reopen roads. Some of my most positive race experiences were the courses with high community engagement. Make sure your local community knows about your race and share ideas for how they can support your runners. Whether you ask people to bring cowbells and motivational signs or spray runners with a garden hose, get people involved. I’ve even entered races that featured local DJs and bands along the sidelines which created a strong sense of excitement. The more alive and community-powered your event feels, the more fun your runners will have and the likelier they’ll be to sign up for next year’s race. Expos are a great way to involve corporations and local businesses at your event. I look forward to trying new products and shopping for any last minute items I may need for the race. Consider which organizations you could recruit to participate in your expo in order to deliver a valuable experience for your race participants. If you host an annual 5K or run/walk event, your organization is in a position to attract recurring business for local hotels. Designating an official “race hotel” is a great way to accommodate out of town participants and offer perks that delight your runners. Possible perks include packets of information at the front desk, a special runners’ breakfast, and event shuttles. Runners will resort to extreme measures if we have to, but please don’t make us. Provide ample opportunity for your event participants to use a restroom before, during, and after your event. When planning for portable toilet rentals, consider key factors like the percentage of women attending your event (to avoid notorious long lines) and whether or not you serve alcohol. Entertaining races have a lot in common, but there are certainly subtle ways you can delight your participants and take your event to the next level. I distinctly remember times when I was pleasantly surprised by different and creative offerings at refuel stations. My favorites include volunteers holding out Vaseline, popsicles, ice cubes, and energy gel shots. I’ve also run races that set up sprinklers for runners to run through. If you’re planning to organize a marathon, USA Track and Field certification affords your race participants the ability to use your race to qualify for the Boston Marathon. This will open your event up to competitive runners who may not consider your race otherwise. Whether it’s rain, thunder and lightning, or a medical emergency, your event staff needs to be prepared to deal with anything. Develop a plan B for as many hypotheticals as possible and consider if event insurance is a smart investment for your organization. To mitigate risk to your event participants, keep them informed about the weather and what they can do to prepare. For longer races, you should also have medics onsite on the actual course on cycles to ensure quick response to any medical emergency. A medical tent with EMTs and an ambulance at the post-race area is also a must for longer distances. Pace runners agree to complete each mile of your event at a designated pace. This pace is typically denoted by projected end time. For example, runners aiming to complete a half-marathon in two hours would keep an eye on the pacer holding/running with a 2:00 sign. These are generally very experienced runners who can maintain a set pace throughout the entire race to help keep other runners on track. One idea is to contact local shoe stores and ask their employees to run as pacers in exchange for their company’s brand exposure. Race technology has advanced significantly in the last decade. From registration and fundraising software that can allow your registrants to raise money on behalf of your organization or participate virtually, to timing software that provides runners’ family members with split time text alerts, investments in top-notch technology will ensure your race is an event that runners won’t forget. Don’t let your race participants forget about their positive experience. It’s important to follow up with runners to thank them for their participation. By keeping them in the loop with your email communications, you can help them get excited for next year right away. I typically purchase race registration as soon as a race goes on sale, and if it’s an event I run every year, I have a calendar reminder set to ensure I don’t miss purchasing before prices increase. Be sure to hype your past participants up for the sale of next year’s tickets by keeping them informed of important dates and consider offering them a presale discount as a way to thank them for their previous support. In order to create a positive experience for your participants, it’s important to provide them with tools that will set them up for success. This extra support will encourage them to recommend the event to others and participate year after year. To save you some of this heavy lifting as you plan a fun run for charity, we’ve created an eight-week 5K Training Plan. Your organization can distribute it to event registrants so that they can prep leading up to the big day. All you have to do is download and add your logo. 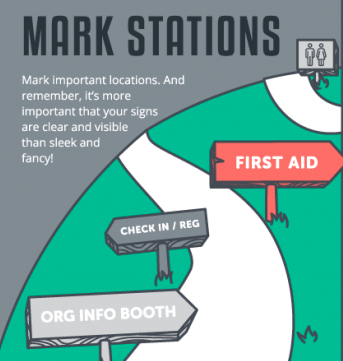 That way, it’s branded to your organization, and your nonprofit will remain top of mind after your registrants tape it to their bathroom mirror. The following plan was developed from over 12 years of personal running experience. Each day has a beginner-level workout, as well as a workout for intermediate runners and a helpful list of tips for running success. The 5K run/walk is one of the most popular types of fundraising events for nonprofit organizations. But the financial return isn’t the only thing that makes it so effective. It’s powerful because of the way it also joins like-minded people together. When you take measures to organize an event that truly exceeds your participants’ expectations, you generate positive word of mouth for your organization that boosts event loyalty and profitability. But beyond planning the ins and outs for the day of, it’s equally important to market your event in the time leading up to it in a way that will increase participation. Get more information on how to make your next 5K event a fundraising machine in the guide below.